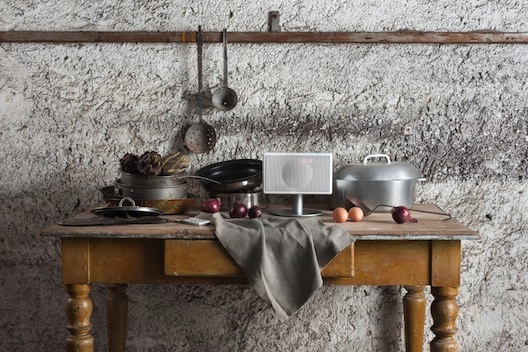 All about the new Geneva Labs Model S Wireless sound system at Totally Wired. The new Geneva Model S Wireless NZ$595 including GST. ’With such superb sound quality for a wireless speaker, it’s hard to see why we’d want to stream in any other way. The Model S is classy in every way, and deserves a place in your home’– Winner 'What Hifi' 2015 best Wireless Speaker Award for it&8217;s price. 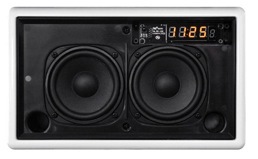 When you first see a Genena system it is easy to get the impression that there is just one speaker behind the cover. But as you can see here there is rather more going on - two very high quality drivers mounted in a substantial ported faceplate. Behind that lurk two extremely efficient Class D amplifiers with a very generous 30 watts - which starts to explain why the little Geneva has such a big sound. Touch the top of the Geneva S and it comes to life dash; the backlit touch sensitive control panel appears and you're ready to go. 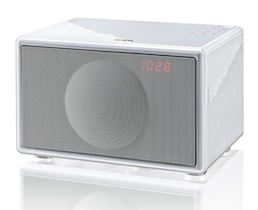 Of course you might also appreciate that the Geneva S Wireless is also a quality FM radio with 6 digital presets. And the built in clock and alarm can prove rather useful. Not to mention the line in facility which will allow connection to components like Apple Airport should you want to enjoy all that wireless networked systems can offer. The Model S Wireless is a box full of surprises. 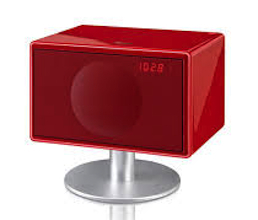 Still avaiable is the 'S' model with the concealed iPod dock which rotates when you’re ready to play. Most importantly, the Geneva Model S just sounds very, very good. 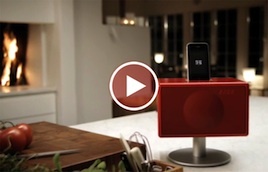 Play music wirelessly via Bluetooth or connecdt through the line–in input. If you have recorded at a high bit rate or in Apple lossless, you'll get the best sound but it also has the uncanny knack of making 128kb recordings sound better than you'd expect. There is something rather cunning in the way the amplifiers work in that with just about any type of music you can run the volume control right up to 90/100 or even a bit more before things get ragged. We've found that, like a larger speaker system, you can improve sound quality with positioning, but there are also controls for bass and treble to refine the sound in any situation. When compared directly with other options, we have to say that the Geneva is still the front runner in terms of straight sound quality. It's easily the best in terms of how well it is constructed - more solid, better finished. It gives away nothing in terms of features and and has the most finish options. And to cap it all off, the Geneva actually costs a little less! The new Geneva Model S System from Totally Wired - NZ$595 including GST. 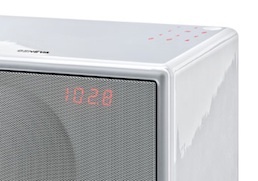 Includes Bluetooth, FM radio, stand, remote control, alarm clock, stereo speakers and line input. Choice of high gloss red, black, white or NEW Matte black, white finishes. Impressive as the Model S is, it's just the start of the Geneva Range - if you like what the Model S does but want more, then it's time to learn about its bigger and even more accomplished brother - The Geneva Model M.